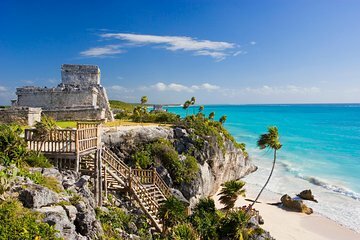 Goditi un rilassante viaggio alle rovine archeologiche di Tulum in questa gita di un giorno da Cozumel. Arroccata in cima a un promontorio con ai piedi paradisiache spiagge di sabbia bianca, Tulum ti offrirà scorci indimenticabili da fotografare. Scopri l'eredità culturale e il folklore dell'antica città maya da una guida esperta che ti accompagnerà tra affreschi e templi come El Castillo e la Casa delle Colonne. I viaggi in traghetto e il trasporto al sito archeologico sono inclusi. First off - Make sure you give adequate travel time from the ship to the Ferry terminal. I made it with a few minutes to spare. But the guides were ready and organized. The 45 minute ferry ride to mainland is not pleasant. The next 45 minutes in the mini bus was fine. They gave us water when we boarded. When we got there there was a quick bathroom break then off to get our guide to the ruins. Our guide was quite pleasant and told a nice tale as we walked through the site. The views are spectacular. After has was done we had about an hour to wander on our own then meet back at the drop off. Our trip guides were waiting for our return and had Subway subs and drinks waiting for the return trip. All in all, about 2 hours of travel time each way and 2 hours at the site. Great to see once. Not worth the trip to do again. Cozumel is extremely busy. Most of the ships park a long way from the ferry terminal so count on using a taxi. Its $8 (for up to 4) one way to the furthest. So form a group. Our guides were great. They made sure we stayed together and got on and off the ferry and buses. The ruins were made interesting by the guide that we had. He had a lot of information about the Mayan culture and the things that they discovered so many years ago. Our guide had many pictures to show us which illustrated what he was explaining. That really is what made it very interesting. Was all we expected and more. The tour operator took great care of us. They were with us all the time and very helpful for all our needs. I would recommend this tour to anyone. There is some walking involved, but nothing most people can't handle. Cold water was provided at the start of the tour and cold drinks and subs.at the end in the air conditioned bus. Great opportunity to learn about Mayan History. Great tour guide who knew everything about that history. This was a very difficult trip. We took a fast ferry over to the island. This was the beginning of winter and the water was very, very rough. Almost the entire group of all the people on this ferry were sick. The staff was very busy passing out barf bags and paper towels. One new thing I learned is that they also passed out cotton balls in alcohol to smell to cut the feeling of nausea and it did help. Just not enough! The guides who arranged all the transportation, lunch and arrangements were excellent. However our actual guide for the tour was poor. His name was Lemuel and he was more interested in showing us pictures in his book and proselytizing than actually give us a proper tour. This was short and not so sweet. The ride to and from the ruins in the van was just fine and comfortable. The ride back on the ferry was not as horrific as the sea had calmed somewhat, but not enough so that I did not get sick again. I have never been sea sick before after many cruises, but this was over the top. Please be aware that it is a problem when the water is rough in the winter. Muy buena excursion, estaban bien organizados. Salimos justo a tiempo y llegamos a cozumel como a las 3 pm, con bastante tiempo antes de que el crucero saliera del puerto. Nostros caminamos como 15-20 minutos hasta el ferry. Los recomiendo. 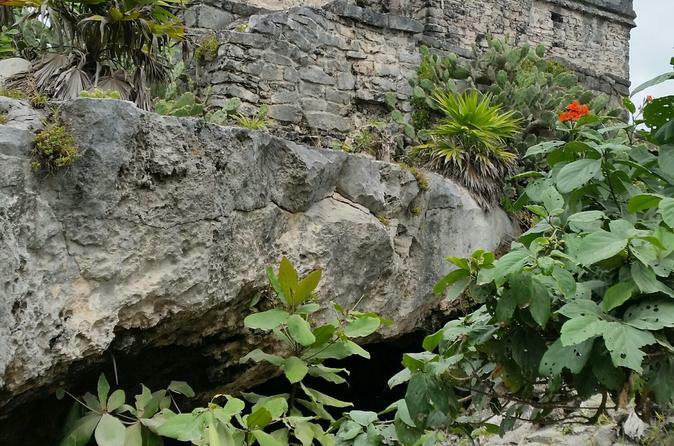 A really interesting trip and tour of the Tulum ruins. The local guide, Santiago, was really good, knowledgeable and had a good sense of humour. The slight disappointment was the size of the beach and the fact that it was mostly covered in seaweed, so not much room to stop there. Overall, a good experience. arrived at meeting point and edger our guide was there waiting, we had to cross over to Carmen via ferry which is about 35 mins, unfortunately we picked the day when the water was very rough and if like me you suffer with sea sickness then expect a very rough journey!! once on the other side we had bus journey to the ruins and was given a guide to show us round who was very informative, we then has hour to ourselves to look around and then back for the rough ferry again. viator put on a very good trip and not there fault the sea was so bad , would recommend when sea was calm! !